FIGURE 1 ■ Trocar placement in the a transverse (horizontal) incision is made on the bladder mucosa overlying the prostate preperitoneal space. lobes in the vicinity of the bladder neck area. This semicircular mucosal incision, extending from the 8 o'clock to the 6 o'clock and further extended to the 4 o'clock position, is deepened until the prostate adenoma is identified. 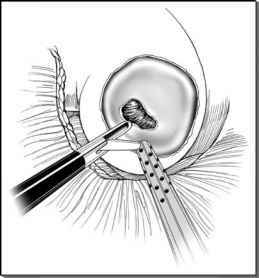 Careful blunt and electro-cautery dissection is performed to reach the proper subcapsular plane outside the prostate adenoma (Fig. 3).